When an opponent loses a faceoff against a Troublemaker here, gain control of an opposing Friend involved in that faceoff. 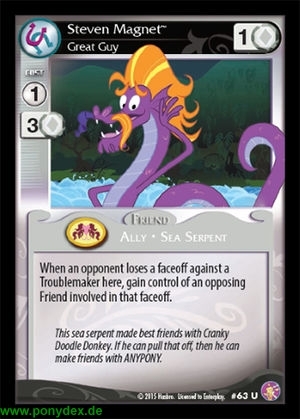 This sea serpent made best friends with Cranky Doodle Donkey. If he can pull that off, then he can make friends with ANYPONY.